In the Celtic religion, everything in the natural world contains its own spirit. Each tree, spring, stream, mountain and rock possesses its own divine force. These ancient mysteries are rooted within mythology, and legends tell of living beings magically turned into stone, their spirits alive but sleeping within the cold grey rock. These Standing Stones are enduring symbols from the megalithic age when the Dolmens, Cromlechs and Menhirs were raised at the sacred nodes of the living land. 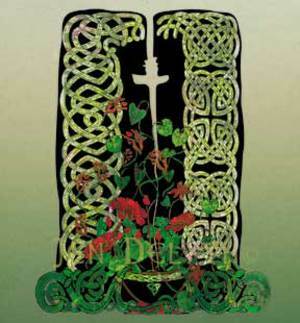 The source of the greening vines - the Tree of Life - is the Celtic cauldron of rebirth, the Grail, representing healing and regeneration, symbol of the spirit forever renewing itself. The Celts understood the mystery of the interconnection of life and death, the one not possible without the other. The red Poppies are associated with dreams, sleep and death. Red is the color of the Otherworld, and represents the supernatural. The Sleeping Lord - Arthur Pen Annwn - King of the Otherworld, sleeps deep in a Welsh mountain, guarding the sacred vessel. Legend tells us that when the world is in its gravest need, Arthur will be awakened by the music of a horn, and will return.